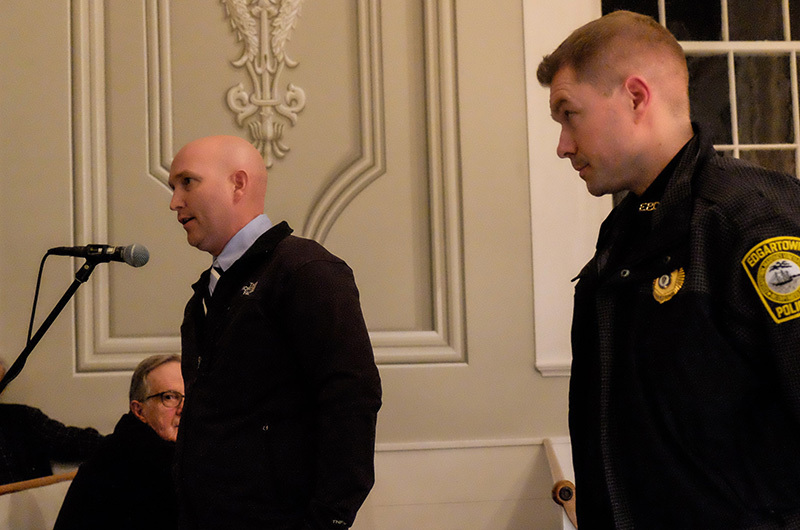 Edgartown fire chief Alex Schaeffer and acting police chief Chris Dolby spoke against funding request at town meeting. While dozens of spending measures sailed through town meetings this week with little debate, voters in Edgartown, Oak Bluffs, Tisbury and West Tisbury all defeated requests to fund a share of the Island’s emergency communications center, which coordinates response to 911 calls Islandwide. The articles had been added to the town meeting warrants by petition of Dukes County sheriff Robert Ogden, who oversees the communications center and the county jail. The sheriff was soundly rebuffed earlier in the year when he made the rounds of town boards of selectmen and financial advisory committees asking them to fund 100 per cent of the $600,000 operating cost of the communications center. Several town officials said at the time they were surprised by the sudden need for municipal funding since the sheriff’s office is now part of the state budget. Instead, the sheriff went directly to the voters looking to obtain 50 per cent of the center’s cost. The warrant articles asked each town to fund an amount that the sheriff said was proportionate to the number of calls the communications center receives from each town. Until 2010, when the state took over responsibility for all the sheriff’s departments in Massachusetts, the communications center was funded through Dukes County, which assessed towns for part of the cost. The sheriff, a West Tisbury resident, attended the annual meeting in that town on Tuesday night, where he outlined his reasons for the request. West Tisbury’s share of the funding amounted to $36,581. But selectman Skipper Manter, who is also a West Tisbury police officer, chastised Mr. Ogden for not coming to the selectmen to ask their support in lobbying the state and legislators for help instead of petitioning town meeting for funding. He also urged town voters to defeat the article to send a message to the state. The measure was rejected on a voice vote. In Edgartown, the article also sparked an extended debate. 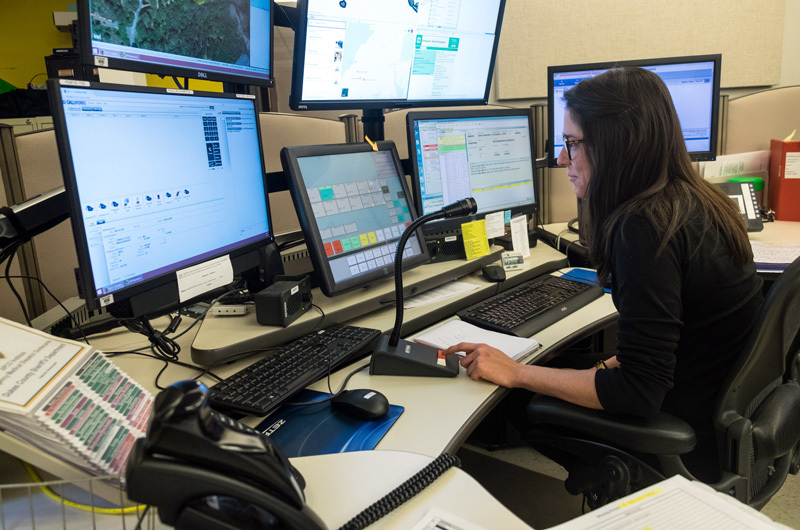 Susan Schofield, director of the communications center and an employee of the sheriff’s department, said communication equipment at the facility is in dire need of a major upgrade. There is general agreement that the Island’s emergency communications systems are technologically outmoded, and a committee of the Island fire and police officials has been working separately on that issue for more than two years. Edgartown fire chief Alex Schaeffer who sits on the committee, spoke against the sheriff’s article, saying it would be premature to make a decision on the complex issue. Paulo DeOliveira, chairman of the financial advisory committee, explained his committee’s decision to unanimously recommend against the article. The warrant asked voters to appropriate $92,953 to operate the communications center in the coming fiscal year. Following the debate, Edgartown voters defeated the article on a voice vote. Voters in Oak Bluffs and Tisbury also rejected the requests after a brief discussion. The funding question appears on the warrant for the upcoming annual town meeting in Chilmark, although with four towns rejecting their requests for funding, the next steps in the process are unclear. Sheriff Ogden could not be reached by the Gazette this week for comment.